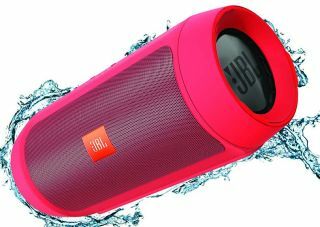 Splash out on JBL's latest Bluetooth speakers | What Hi-Fi? The Charge 2+ (£150) and Clip+ (£50) are both splashproof, portable and wireless speakers, available in a multitude of colours. The JBL Charge 2+ features a 6000mAh rechargeable battery, which JBL claims should be good for around 12 hours use. Alternatively, you can choose to use the built-in battery to juice-up your smartphone through the speaker's USB socket. Social Mode allows up to three people to connect to the speaker and take it in turns to stream music, while noise and echo-cancelling technology combine with a built-in microphone to allow you to take calls. The Charge 2+ is out now and available in black, blue, grey, red and teal. With the JBL Clip+, the clue is in the name. It features a built-in carabineer so you can clip it onto something when you're out and about - the double-injection housing is designed to protect the speaker from bumps and bruises. Being smaller than the Charge 2+ the built-in battery takes a hit in size, but JBL claims you should still be able to enjoy around five hours of playback. In a slight twist, there's an integrated 3.5mm cable which you can use to connect to an alternative source, or even daisy chain a couple of the speakers together. The Clip+ goes on sale in July and will be available in black, blue, red, grey, teal, yellow, pink and orange.